Fortnite is getting a third new vehicle. After the Shopping Cart and ATK were both added to the game in Season 5, the QuadCrasher has just appeared in the “Coming Soon” section that appears as players load into the battle royale. 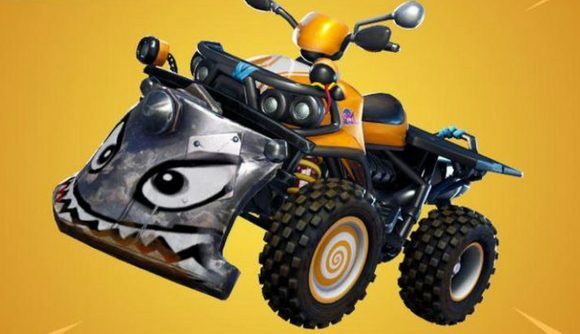 The new vehicle’s description reads “charge the boost to crash through structures or get some air.” That means two things – the first is that the Quadcrasher will likely have the same boost mechanic as the ATK – a three-tier system that increases in power as you drift, allowing you to jet away in a burst of speed. It also means that that battering ram-style implement on the front of the vehicle isn’t just for show. While the ATK and Shopping Cart both take damage when you hit other objects at speed, the Quadcrasher is apparently designed to just burst straight through them. I’d assume that the more boost your have built up, the more structures you can get through in one go. The question remains whether you can go fast enough to get through an entire house at once. From the image of the Quadcrasher that appeared on the game’s loading screen, it looks as though it’ll be able to ferry two players – one driver, and one on the platform on the back, who’ll be able to fire weapons and heal. There is, however, very minimal cover, which could put that passenger in some danger. As ever, the release of this new vehicle is something of a mystery. I’d assume, however, that it’ll appear towards the beginning of next week – Epic is known for its breakneck pace between announcement and release, so Tuesday’s patch will likely bring the Quadcrasher to the game.